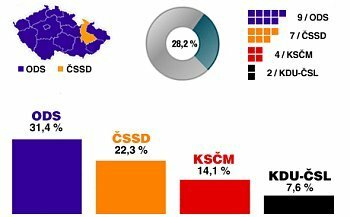 The right-of-centre Civic Democrats topped the polls in Czech voting to the European Parliament. The party of former prime minister, Mirek Topolánek, gained 31.4 percent of the votes, well ahead of the left-wing Social Democrats who came second with 22.3 percent. The Communists took third place with 14.1 percent of the vote and the Christian Democrats came fourth with 7.6 percent. The results mean the Civic Democrats will hold onto nine out of the country’s 22 seats. The Social Democrats improve on their disastrous showing in 2004 with seven seats. The Communists have fallen back to four and the Christian Democrats have held onto their two seats. None of the smaller parties made it past the 5.0 percent threshold. Turnout was 28.0 percent, around the same level as 2004.